Soda ash is progressively being used as a fluxing agent to lower the melting point of the furnace, which is required to melt silica. The utilization of soda ash has reduced the overall energy consumption in glass manufacturing industries; the demand for flat glass and container glass will continue to be significant in upcoming years. Container glass is also being increasingly used in food and beverage and pharmaceutical packaging industries, thereby generating significant traction in the market. There has been a substantial rise in production of glass over the past few years owing to high demand from automotive, and building and construction industries. Apart from glass manufacturing, soda ash is also used for the manufacturing of a number of chemicals such as sodium silicate, sodium bicarbonate and percarbonate, and sodium chromate and dichromate. It is also used for the manufacturing of dyes, coloring agents, adhesives and sealants, amongst others. Manufacturing of pulp in the paper and pulp industry also consumes soda ash on a large scale. In the metallurgical processing industry, soda ash is utilized for the recycling of aluminum and zinc. An expanding application base is foreseen to be a key driver impacting the growth of global soda ash market. Over the recent past, there has been a notable increase in the production of glass, majorly flat glass and container glass, amongst others. These glasses use soda ash as an important material for the manufacturing process. Glass and ceramics production has been a major end use of soda ash and is responsible for almost 50% of the overall consumption. There has been noteworthy growth in the production of glass, especially due to rising demand from automotive, construction and renovation industries. Flat glass is increasingly being used in buildings, window panels and vehicles, amongst others. With steady growth of automotive and construction industries, especially in developing countries within Asia Pacific region, consistent rise in glass production has been registered. Furthermore, container glass sales for food packaging, pharmaceutical packaging and personal care packaging is also projected to create traction in the market, which is likely to have a positive impact on the demand for soda ash in near future. Soda ash is a vital raw material used for the production of various chemical fertilizers, dyes and coloring agents. It is also used as a chemical in preparing pulp for the paper and pulp industry. A number of adhesives and sealants are also being manufactured with the help of soda ash. Several chemicals, such as sodium silicate, sodium bicarbonate and percarbonate, and sodium chromate and dichromate, are produced using soda ash, which is expected to generate significant traction in near future. In the metallurgical processing industry, soda ash is utilized for the recycling of aluminum and zinc. It is also employed for removing phosphates and sulfurs from ferrous and non-ferrous ores. Additionally, soda ash is also added to pools, lakes and spa which helps to maintain alkalinity of water and remove acidity. 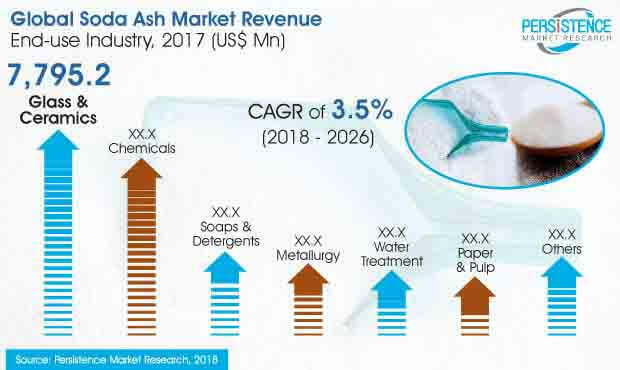 Aforementioned factors are identified to be primarily responsible for sustained sales of soda ash market on a global level. However, the overall growth prospects remain passive throughout the forecast period.